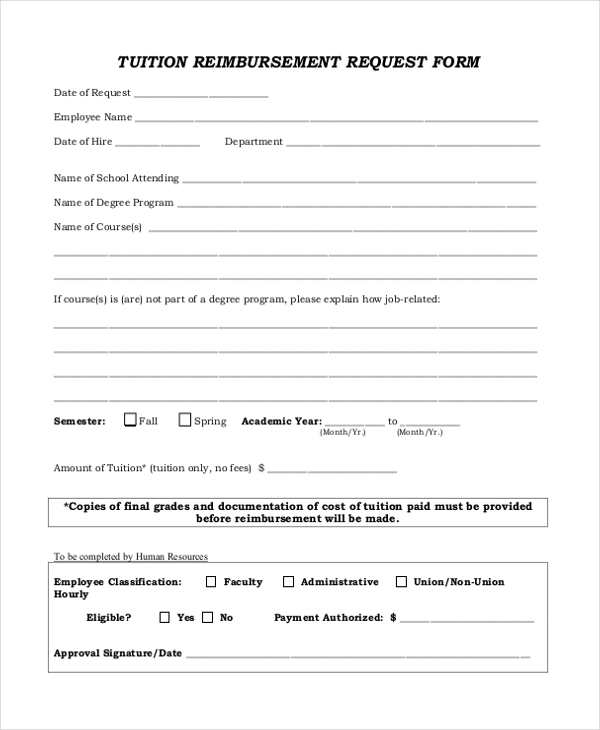 A tuition reimbursement form is a handy tool which is used by employees to request their company organization to repay their respective tuition amount for the college course which the employee or his child may have applied for and studying for. They are different kinds of Reimbursement Forms available which are used by companies in the corporate sector. The crux of these forms is to facilitate the process of reimbursement between the company and employee. 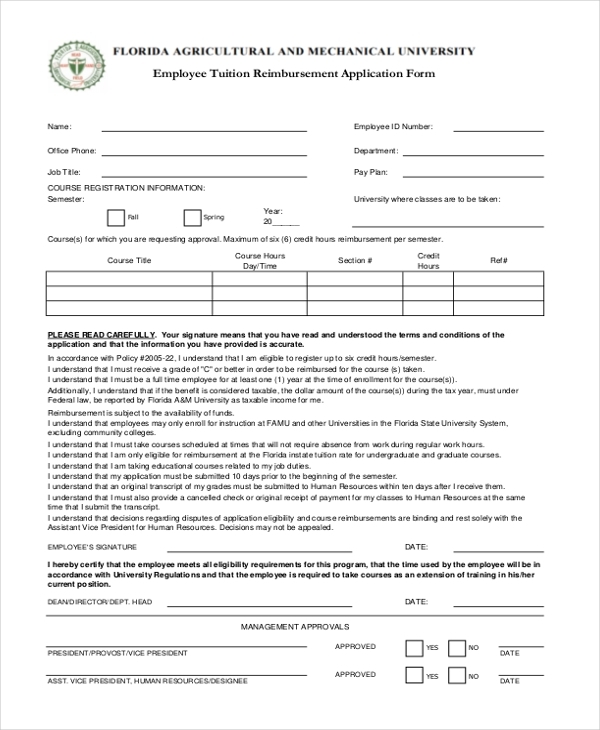 A tuition reimbursement form is usually used in scenarios wherein an employee wants his company to repay his child/children school or tuition fee. 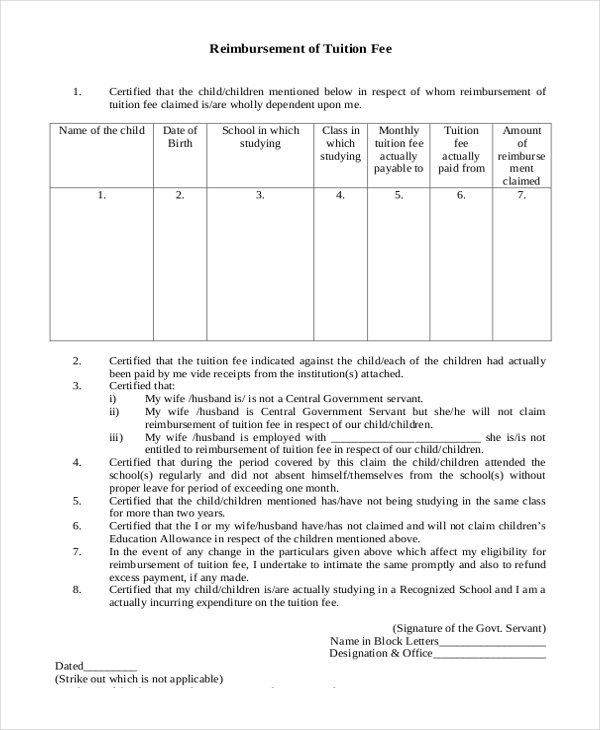 Such a form serves its purpose only if and when the said employee’s child/children are certified for reimbursement. The form needs to be furnished with accurate particulars in order to be processed and approved without fail. A tuition reimbursement request form is meted out to employees who are working as well also studying. If the employee is signed up to receive a reimbursement of his tuition expenses, then he can apply for a reimbursement by populating his details in a request from such as the one shown here. In case an employee would like to be considered as a subject for the tuition reimbursement scheme in their company, then the concerned employee can establish their details in a tuition reimbursement application form and forward it to the related authority to take action on the same. 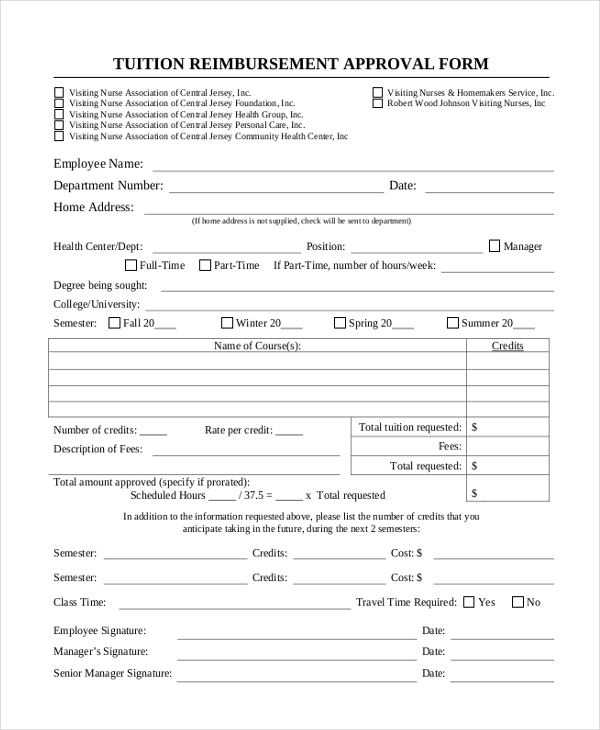 A tuition reimbursement approval form makes itself useful when an employee who is enlisted under the reimbursement program wants to apply and get approval for his reimbursement request. The overall format and layout of this kind of reimbursement are not notably different than the others in this category. Similar to a tuition reimbursement form, a tuition reimbursement proposal form is also on the same lines. Information of the applicant employee coupled with information regarding the course enrolled and the tuition fee which has been paid by the employee and needs to be reimbursed by the company. Details such as date of payment also need to be specified. As stated earlier, many employees enroll and reap benefits from their company’s tuition reimbursement plans. If not for their own, the reimbursement is sought for their child/children’s tuition fee expenses. Information on the form must be inserted correctly and precisely. In order to be eligible for tuition reimbursement, employees are encouraged to apply at the soonest as funding is available on First-Come-First serve basis. The details of the employee, followed by college/university information needs to be appropriately filled up in the relevant fields. It is necessary that employees be a part of the company’s tuition reimbursement scheme before they move ahead and apply for a tuition reimbursement form. In the case of teachers too, the rules are no exceptional. Their employer will only repay their expenses to teachers if and when they enlist in the company reimbursement program beforehand, and also that their tuition fees are at par with the brackets set by the company’s management. 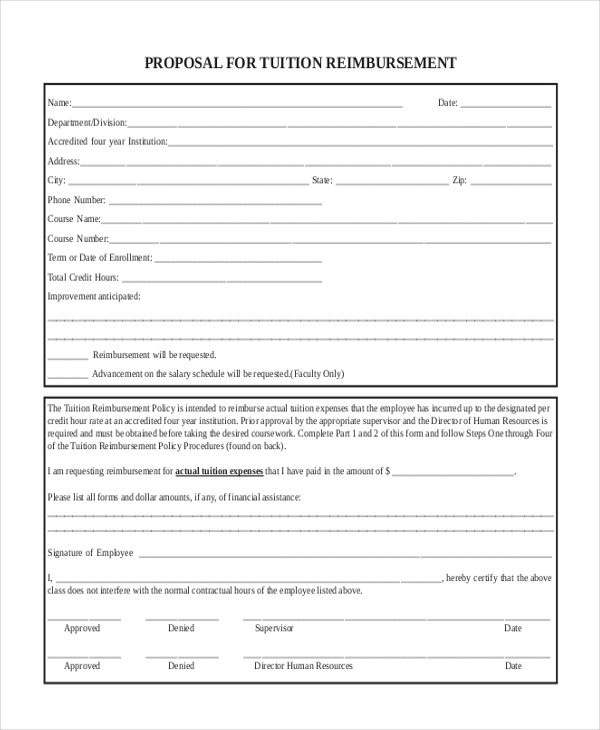 Tuition reimbursement forms are used by employees in a situation where they would like to apply or be made eligible to receive a repayment of their tuition expenses from their employer company. There are several companies worldwide which provide its employees with the facility of reimbursing tuition for the employee or their child/children. 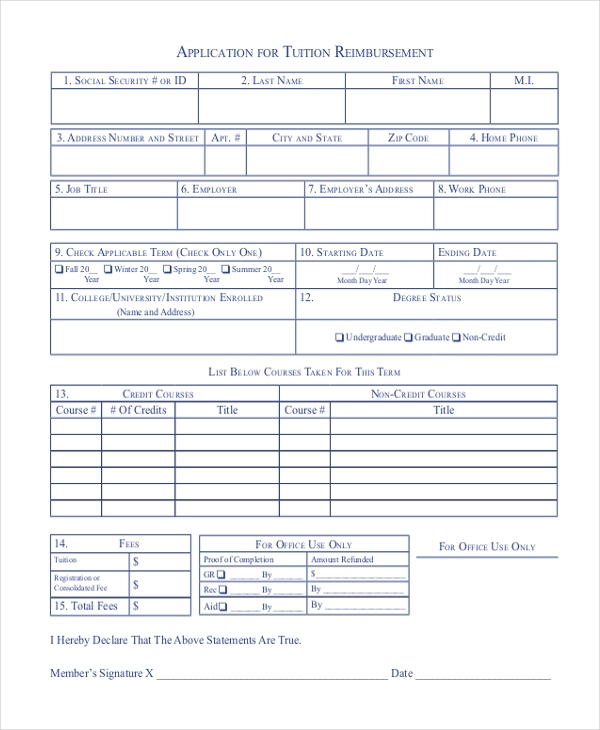 A tuition reimbursement form is a document which contains the specifics of the monthly, half-yearly or yearly tuition expenses of applicable employees. 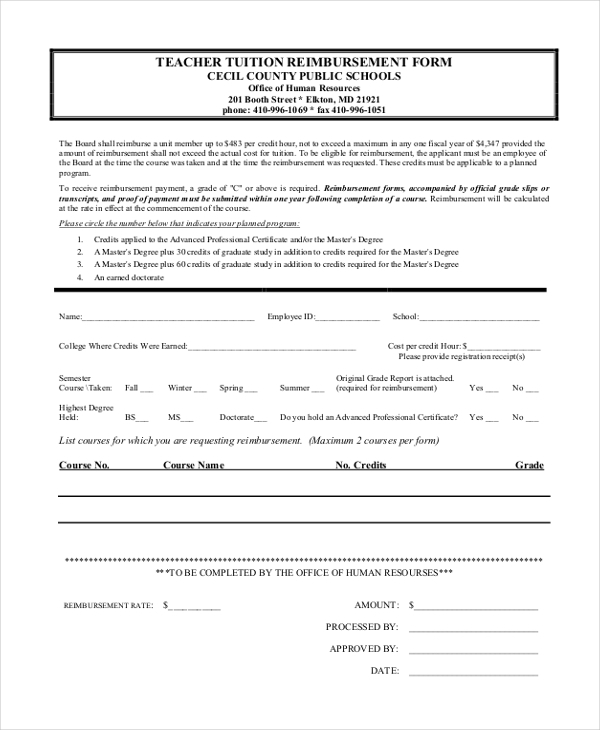 You may also see Medical Reimbursement Forms. There are many benefits attached to tuition reimbursement forms. Among the plusses, the bigger one is that employees receive a cushion if and when they become eligible to receive a monetary compensation for their academic pursuits from their organization. Having tuition reimbursement forms in the midst gives an opportunity to the HR and accounts department to collectively monitor and oversee the cycle of reimbursements made towards different eligible employees. The details mentioned in the forms obviously go through verification and review process before the payments are wired into the concerned employees’ accounts. Where to Find Tuition Reimbursement Forms? Tuition reimbursement forms are conveniently gettable on websites across the Internet. There are a plethora of websites which offer users to directly download any of the sample forms and can edit and customize them as per their preference and requirement. The USP of these forms is that they are ready-made yet editable. A bigger bonus is that the templates exist in MS Word, PDF, MS Excel and PSD format. You can also see Employee Reimbursement Forms. Tuition reimbursement forms are very vital for the fact that they facilitate the HR to carry out a record-keeping exercise for the employees who are enlisted and certified to receive reimbursement of their tuition fees from the company. 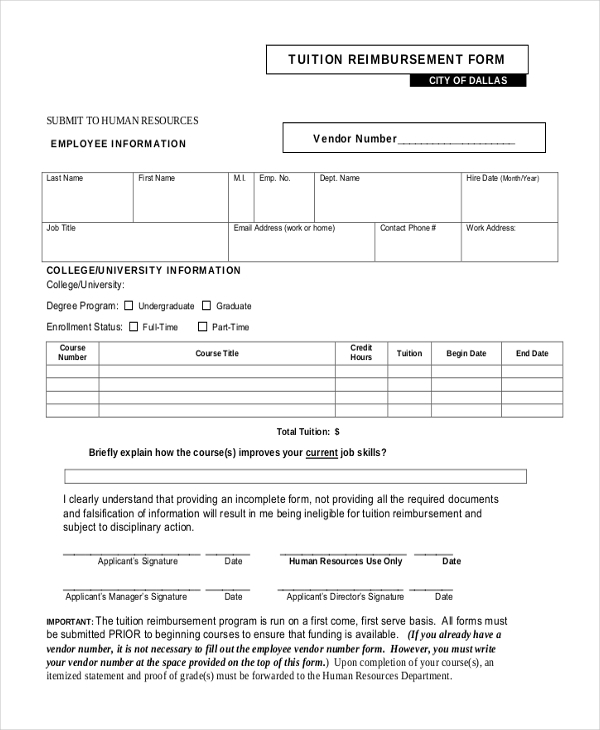 Thanks to tuition reimbursement forms as HR departments can easily keep tabs on the aspect.